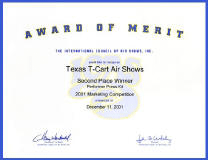 Jest a little braggin’ here… we’re real proud of the many awards the Texas T-Cart Team has! 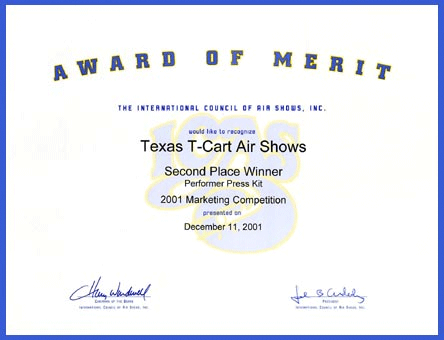 The Texas T-Cart Team was the second place winner in the “Performer Press Kit” category in the International Council of Air Shows 2001 Marketing Competition. 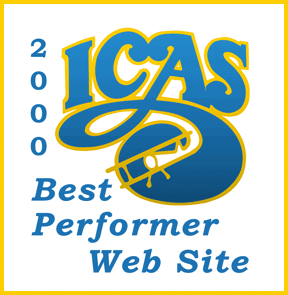 In 2000, the Texas T-Cart web site (yep, this one) was selected as the Best Performer Web Site during the International Council of Air Shows Marketing Competition. Randy was the Sporty’s Formula One National Aerobatics Champion in both 1999 and 2000. Organized by aerobatic legend Duane Cole, the event provided an aerobatic contest for grassroots flyers.